The awards continue to roll in for the redesigned 2013 Ford Fusion. The most recent accolade comes from Connected World Magazine, who named the 2013 Ford Fusion Energi as its 2013 Connected Car of the Year. Ford did not simply give the Fusion a new award-winning exterior design when it redesigned the sedan for 2013. 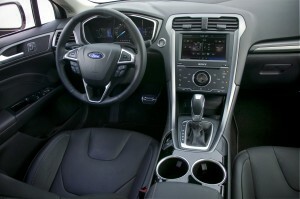 The Michigan dealer placed a premium on in-car connectivity, and the 2013 Fusion boasts the most complete array of convenience and entertainment features of any sedan in its class. The 2013 Fusion Energi is a plug-in hybrid that is equipped with standard features, including SYNC® with MyFord Touch® and the unrivaled connectivity of the MyFord® Mobile smartphone app. EPA figures were recently released for the 2013 Ford C-MAX Energi plug-in hybrid, and the numbers shattered what even Ford had estimated the C-MAX would return. The 2013 C-MAX Energi has an EPA-rated 620-mile overall range and a 21-mile electric range. The 620-mile overall range is an impressive 70 miles greater than what Ford had estimate the hybrid compact SUV would deliver. The 2013 C-MAX Hybrid Plug-in is powered by a 7.6-kWh lithium-ion battery pack that returns 108 MPGs (miles per gallon equivalent). Once the battery pack is depleted the 2.0-liter I-4 Atkinson engine with an electric motor kicks in and is able to return an impressive 47 mpg highway and 47 mpg highway while functioning as a hybrid. Ford made a big splash at the North American International Auto Show this week with the official debut of the 2013 Ford Fusion. The automaker also announced plans for a plug-in hybrid Fusion Energi a few months after the Fusion arrives in showrooms. The 2013 Fusion joins many other sedans in offering a 4-cylinder engine only. Other updates to the sedan include new styling that resembles a four door coupe more than a standard sedan and a multitude of standard and optional features. These features include the latest version of SYNC with MyFord Touch, BLIS, SOS post-crash alert, and an optional lane-keeping aid. A hybrid model of the Fusion will also be available, with a 2.0-liter naturally aspirated 4-cylinder engine, based on the 2.0-liter EcoBoost turbo. While news of a redesigned Fusion has been floating around for months, the announcement of the Fusion Energi took everyone by surprise. According to Ford, this PHEV will receive an EPA fuel mileage estimate over 100 MPGe. The Fusion Energi plug-in hybrid will go on sale about five months after the Fusion’s release in late summer or early fall of this year. With Christmas travel fast approaching and snow in the Arizona mountains, Sanderson Ford offers a Top 10 list of driving tips to help you and your families stay safe on the roads this season. 10. DO allow extra time to brush and scrape your vehicle and don’t forget to bring a scraper with you! With frost in the valley and snow up north, clearing windows is crucial for visibility and removing snow or ice from the top of your car will spare cars behind you from encountering an unexpected snow assault. DON’T forget to clean snow and ice off your headlights and taillights as well. 9. DO top off your windshield wiper washer with winterized fluid to make sure it doesn’t freeze or crack, preventing you from washing away dirt and salt. DON’T try to melt ice from your windshield by pouring hot water on it. Using hot water can crack the windshield. 8. DO wash your car when you return to remove salt and dirt from the roadways. 7. DO keep at least half a tank of gas to prevent stranding yourself in adverse conditions or closed highways. DON’T forget to check that all fluids are at proper levels and ensure all tires, including the spare, have the required pressure and tread. 6. DO prepare your car for an emergency. Make sure you have a blanket to stay warm, proper attire (boots, jacket, hat and gloves) in case you have to be outside for an extended period of time, a shovel, flashlight with fresh batteries and snacks. Keep your cell phone charged. Be familiar with it’s GPS capabilities in case you need to call for help. DON’T forget the kitty litter or sand, to use for added traction if your car becomes stuck in the snow. 5. DO stay aware of what’s around you on the road, including checking your blind spots and keeping an eye out for pedestrians. DON’T follow too closely. The general rule is the vehicle ahead should pass a road marker two seconds before you. In slippery conditions, it is recommended to double the amount of space between you and the vehicle in front. 4. DO apply even pressure when braking in slick conditions if your vehicle is equipped with anti-lock brakes. Keep in mind anti-lock brakes do not shorten stopping distance, but they do help you maintain control. DON’T become overconfident in electronic safety features your car may have. Always test road conditions with cautious driving when the surface area is wet or icy, particularly on bridges and overpasses. 3. DO turn the steering wheel in the direction of the slide when driving on snowy or icy roads until you gain control. DON’T apply power or change directions suddenly on snow or ice. 2. DO stay calm if you find yourself stuck in the snow or broken down on the side of the road in bad conditions. DON’T leave your car unless available shelter is near. If you need to run the engine to stay warm, make sure the exhaust pipe isn’t clogged with snow so the interior stays clear of harmful carbon monoxide. 1. DO stay awake and alert behind the wheel. If necessary, take a break and grab a coffee. As Arizona residents, we sometimes forget what it is like to drive in these conditions. Don’t be caught in a bad situation and enjoy your holidays. Merry Christmas from the employees and owners of Sanderson Ford! Ever since it was introduced at the NHRA Winternationals in 1968, Ford’s Cobra Jet Mustang has created a legacy of power, performance and triumph. That legacy was renewed in 2008 when Ford Racing offered a limited run of the 40th Anniversary Cobra Jet Mustang that quickly sold out. Subsequent 2010 and 2012 model year offerings of the Cobra Jet have proved just as popular. The 21st century CJ has carved its own legacy at drag strips across the country, becoming the winningest late model in NHRA with national event wins in 2009, 2010 and 2011 and numerous class records this season alone. On Friday Dec. 2, Ford Racing unveiled the 2013 Cobra Jet Mustang at the Performance Racing Industry show in Orlando, Fla.
With more than three seasons of testing, racing and customer feedback, the 2013 Cobra Jet marks the continued evolution of the factory-produced turnkey race car. Designed for NHRA Stock and Super Stock competition, the 2013 model is better than ever and features the latest drag racing technology for greater speed and consistency. The 2013 Cobra Jet offers two 5.0-liter Ti-VCT engine options. Customers may choose a naturally aspirated engine with Cobra Jet induction system, CNC ported heads, high-lift cams and low-drag accessory drive, or a 2.9-liter Whipple supercharged version with CNC port-matched manifold and heads, and a proprietary 10-rib supercharger drive system for high-rpm use without belt slip. Additionally, the 2013 Cobra Jet chassis has been improved. Lightweight body modifications give better weight distribution and electricpower steering provides better driveability without parasitic horsepower loss. A new roll cage design is optimized for safety and chassis rigidity while the brake pedal ratio has been revised for more modulation and stopping power. And the rear suspension geometry delivers faster and more consistent 60-foot times. The 2013 Cobra Jet is priced to be the best value, with an approximate MSRP of $86,000 with the naturally aspirated engine option and $93,000 with the supercharged engine. Additional options and pricing will be announced in January 2012. Like many of Ford Racing’s previous turnkey race cars, the 2013 Cobra Jet Mustang will be built at the AutoAlliance International plant in Flat Rock, Mich. Production of Cobra Jets will commence in June 2012, with delivery of all vehicles expected midsummer 2012. Cobra Jet components will be available through Ford Performance Parts, allowing racers to upgrade their Mustangs to Cobra Jet specifications. Finally, all Cobra Jet fans can help choose the color of the 2013 Cobra Jet – classic white, silver or black – by voting online at www.fordracing.com. Voting ends Dec. 31, 2011. Ford customers said MyFord Touch could be faster and feature simpler graphics that are easier to use and that’s exactly what Ford plans to deliver with a broad set of performance upgrades to the system – launching first on the new 2013 Ford Escape, Flex and Taurus. Available early next year – and offered at no charge to existing MyFord Touch owners – the software upgrade enhances the ownership experience as it was developed by listening and responding to customer feedback. The new touch-screen interface features simpler graphics and controls that are easier to use. Customers will also experience significantly faster touch-screen response times, one of the top requests from owners. New features include support for tablet devices and Audible.com audiobooks, improved navigation maps and enhanced voice recognition interaction. Since MyFord launched last fall, Ford has held four customer clinics in which hundreds of owners talked directly to Ford engineers about their experiences with the new technology. Owner feedback was clear and consistent, revealing that MyFord Touch was a key purchase reason. A survey of 2011 Ford Edge owners shows that four of the top seven purchase reasons were elements of the MyFord Touch system: the touch screen, steering wheel controls, voice recognition and dashboard styling. While owners reported that they love the system, there were distinct areas where they wanted improvements. Earlier this year, Ford started delivering on their requests, beginning with more instructions and information on how to best utilize the capabilities of the system. Ford launched two programs modeled after what consumers experience when purchasing a new electronic device. First, the company added a new MyFord Touch owner support website featuring how-to videos at www.syncmyride.com. Second, free “SYNC My Ride” personalized training sessions for new owners are now offered through Ford dealers – scheduled at customers’ convenience. All of the new improvements will be offered to existing owners of MyFord Touch-equipped vehicles, including the 2011 and 2012 models of Ford Explorer and Edge and the 2012 Focus. Early next year, owners located in the U.S. will be mailed a USB flash drive with the software upgrade for installation that they can do at their own convenience. If they prefer, owners may also visit their local Ford dealer for the software installation. The upgrade mailing will include instructions informing owners how to simply plug the USB flash drive into the MyFord Touch Media Hub’s USB port in order for installation to automatically begin. The visual enhancements to MyFord Touch are based on simplifying the graphics with larger, bolder fonts, removing low-priority visual content, and designing screens based on a consistent pattern. More than 1,000 screens in total have been updated with the improved look. “Our goal when designing the upgrade was to simplify the screens and give customers a fast and easy way to get information at any given moment,” said Jennifer Brace, User Interface Design engineer for Ford. “That meant removing buttons, relocating high-use controls closer to the driver’s reach, simplifying tasks and improving font size.” The new fonts are as much as 40 percent larger on some redesigned screens. The fonts also are wider and bolder to provide easier legibility, particularly among the rapidly increasing number of drivers age 60 and older. Ford also took the opportunity to update the performance of the system and add new features for customers to help them keep pace with the fast-moving consumer electronics market. Faster touch-screen response time, for example, was a key request from owners. Initial testing shows that touch and voice response is at least two times faster than the current system. Ford’s newest SUV arrives next year, bringing clever technologies and features designed to make life easier, and fuel economy projected to top any vehicle of its kind on the market. Versatile vehicle features new hands-free technology – including liftgate with motion-sensing technology similar to video games’ and upgraded MyFord Touch system that makes connecting with digital devices on the go even easier. New Escape’s projected fuel economy is up to 5 mpg better than outgoing Escape; 1.6- and 2.0-liter EcoBoost engines save customers fuel and money. The Ford Escape, America’s best-selling SUV, will raise the bar even higher with the debut of an all-new model that features 11 new exclusive features and fuel economy projected to top any vehicle of its kind on the market today. “Escape is America’s best-selling utility vehicle, and the Ford team has worked hard to make sure we deliver even more of what small SUV owners really want,” Kuzak said. An available hands-free power liftgate brings new technology to the SUV market and is enabled by motion technology used in today’s video game systems. A gentle kicking motion under the center of the rear bumper activates, unlocks and raises the liftgate when the driver has the Escape key fob. This allows quick and easy access to the cargo area without needing to set down packages or dig out keys. The same process closes the hatch. SYNC with MyFord Touch, offers multiple ways for customers to manage and control information through voice commands, menus accessed through controls on the steering wheel, touch screens, buttons or knobs. Upgraded system includes new look, making phone, navigation, entertainment and climate controls even easier to use. Parallel parking the Escape is virtually stress-free with active park assist. With the press of a button, the system detects an available parallel parking space and automatically steers the vehicle into the space. Drivers control only the gas and brake pedals. Maneuvering parking lots and traveling open roadways becomes even safer and less stressful with Escape’s sensor-based BLIS (Blind Spot Information System) with cross-traffic alert. BLIS displays an alert in the side mirror when a vehicle is detected entering a blind spot. Cross-traffic alert warns if traffic is detected approaching from the sides, such as when Escape is leaving a parking space in reverse. The all-new Ford Escape is the first Ford SUV to combine class-exclusive technology to automatically slow the vehicle when it’s cornering too fast (Curve Control) or help accelerate through a turn (Torque Vectoring Control); a new Intelligent 4WD System helps deliver outstanding handling on pristine pavement and in adverse conditions as well, along with excellent traction off-road. Escape offers Ford’s broadest nameplate range of EcoBoost engine choices yet. Strong fuel economy comes from either the available 2.0-liter EcoBoost engine or 1.6-liter EcoBoost engine, which makes its American debut in the new Escape. Both new engines combine EcoBoost’s core technologies of direct fuel injection and turbocharging and add twin independent variable camshaft timing (Ti-VCT) to deliver even better miles per gallon and save customers money on fuel. In Escape, EcoBoost engines are mated to specially calibrated, six-speed SelectShift Automatic transmissions, which are standard and allow drivers who want more hands-on experiences to manually control gear selection from a switch on the left-hand side of the shifter. The gearbox features a new torque converter for improved driving feel, silky smooth shifts and even better fuel economy. Engineers also installed revised gear ratios for a balanced driving feel in all situations. The standard engine in North America is an updated 2.5-liter, giving the new Escape a comprehensive lineup of four-cylinder offerings. It also is matched to a SelectShift Automatic six-speed. Also aiding fuel economy is Escape’s sleeker design. The new model is nearly 10 percent more aerodynamic than the outgoing model. Plus, the new Escape’s active grille shutter system, which is on all models with the 1.6-liter EcoBoost and 2.5-liter four-cylinder engines, reduces wind resistance. Grille slats stay open when extra engine cooling air is required, such as low-speed stop-and-go driving. When cruising on the highway at steady speeds, the grille slats automatically close to improve aerodynamics and fuel efficiency. Stowing and towing are even easier in the new five-passenger Escape, thanks to a low liftover height of 27 inches, more innovations and cargo volume that surpasses the outgoing Escape – with 68.1 cubic feet of space behind the first row and 34.3 cubic feet behind the second row. The new Escape’s rear seats have been designed to fold flat easily. With the touch of a button, the head restraint folds down and with the lift of a handle on the seat, the seatback folds and dives as the seat folds flat and clicks into position. Escape also features an available two-position load floor, which can be configured to allow the customer to choose among maximum luggage volume or flat load floor. When properly equipped, the all-new Escape maintains a trailer tow rating of 3,500 pounds. Using new advanced software and sensors, the new Intelligent 4WD System analyzes data from 25 external signals, including wheel speed, accelerator pedal position and steering wheel angle, assessing road conditions and driver input 20 times faster than the blink of an eye. The system uses all the sensor inputs to turn the vehicle in the direction the driver wants it to go. Intelligent 4WD builds on the pre-emptive actions by adding and subtracting torque as needed through an electromagnetic clutch. Ford has announced plans to release MyFord Touch 2.0, an updated version of Ford’s popular software that will be seen on select 2013 models. The new MyFord Touch will aim to improve the technology’s ease of use, and Ford plans to make the software more accessible to owners. Some of the changes include larger and bolder on-screen fonts, a simplified home screen layout, and 3D buttons that will more clearly resemble physical controls. On the audio screen, the radio preset buttons will be placed at the bottom of the screen, where they are located on traditional radios. The navigation screen was also revamped to provide better contrast, clearer map displays, and 3D landmarks. In total, 1000 “pages” in the system have been reconfigured. The software will first be available on the 2013 Ford Escape, Flex, and Taurus before being rolled out as a free upgrade for existing MyFord Touch customers. Ford is saving millions of plastic bottles from landfills for the next Ford Escape. The automaker has announced plans to recycle bottles to be used in the carpeting for the all-new SUV, which will make its global debut at the Los Angeles Auto Show on November 16th. These bottles will undergo extensive testing to ensure their durability. Ford engineers will look for “chalking – when the fibers degrade and mash themselves to form a white residue – when conducting these tests. Chalking, or dusting, is a precursor to a hole forming in the carpet. Another way Ford will help diminish wear is by backing the carpeting with cast foam, which creates smoother backing and helps to reduce road noise. Each Escape will use 25 20-ounce plastic bottles that were destined for landfills. This means that more than 4 million bottles can be diverted from landfills, based on current sales data. Dave Tedder is proud to be the Internet Director for Sanderson Ford. Find out more information about this author on Google+.